Instrumentation: 2 flutes (1st doubling piccolo, 2nd doubling alto flute), 2 oboes (2nd doubling cor anglais), 2 clarinets in B flat (2nd doubling bass clarinet in B flat), 2 bassoons (2nd doubling contrabassoon), 4 horns in F, 2 trumpets in B flat, 3 trombones, timpani, percussion (1 player), piano (doubling celeste), harp, strings. Commission info: Commissioned by Adult Education (T.A.F.E.) Tasmania with assistance from the Music Board of the Australia Council. First performance by ABC Tasmanian Symphony Orchestra, Vanco Cavdarski — 21 Apr 77. 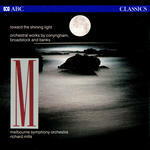 CD: Toward the shining light : orchestral works by Conyngham, Broadstock and Banks. - Book: Meet the music 4, 1996 : resource kit / Sydney Symphony Orchestra Education Program.